Mood Dude items are based on copyrighted images of Creative Therapy Associates, Inc.form characters drawn by Pulitzer Prize winning illustrator Jim Borgman. Happy - Help your customers face their stress with this Mood Dude (TM) Stress Reliever! 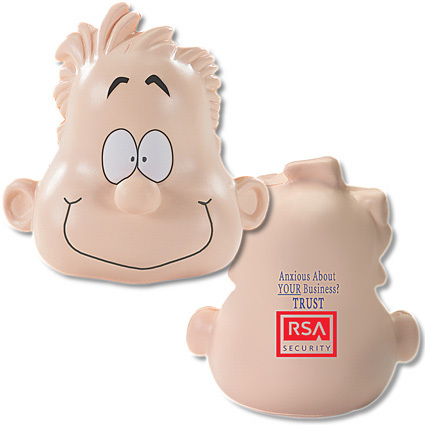 Measuring approximately 2 3/4" sq., this stress reliever in the shape of a character's face. Have your company name and logo printed on this stress fighting favor for a custom keepsake that is bound to come in handy at home or after a long day at the office. With a lifetime guarantee and a supplier that is QCA certified, invest in this giveaway for your upcoming campaign! Closeout. Bulk / 23 lbs / 200 pcs. / 14 x 18 x 14box. Imprint Area: 1 1/8" Dia.